MTSU overpowered Old Dominion early on Friday night to win against the Monarchs 41-28 after an early Blue Raider lead.ue Raiders took an early 24-0 lead and were able to hold on to beat the Monarchs 41-28. The Blue Raiders pounded the ODU defense for 280 yards of rushing and 539 total yards of offense. The defense was constantly on the attack, racking up four turnovers and six sacks. Kevin Byard played especially big, forcing a fumble, picking off a pass, and returning a punt for a 76-yard touchdown. The offense came up huge, rushing for 280 yards on Friday night, predominately from running back Jordan Parker, who carried the ball 31 times for a career-high 158 yards. However, he was not the only Blue Raider to have a career night. Quarterback Austin Grammer completed a career-high 25-of-30 passes for 259 yards and two touchdowns. He also came up big in the running game with 67 yards and two touchdowns. MTSU jumped out to a 24-7 lead at the end of the first half, but ODU would not go away. 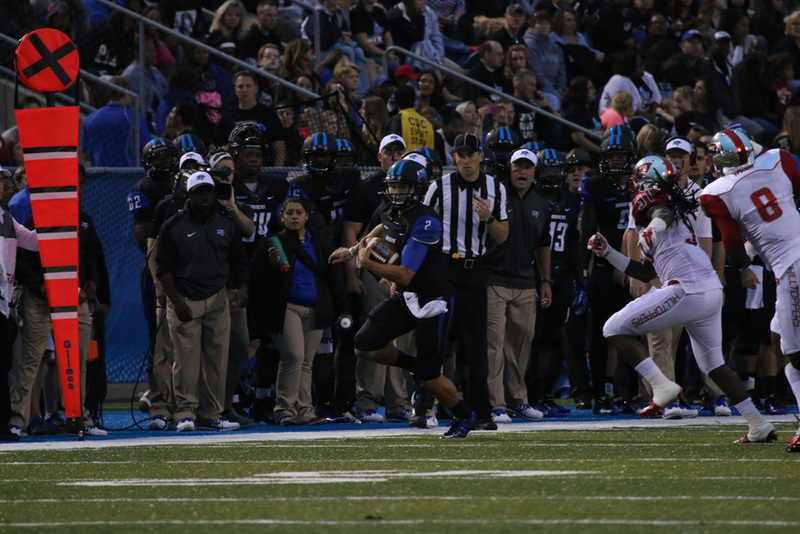 The Blue Raiders were driving early in the second half when running back Shane Tucker fumbled on the ODU 6-yard line. The Monarchs proceeded to drive the ball 94 yards and scored on a 20-yard touchdown pass from quarterback Taylor Heinicke to wide receiver Antonio Vaughan. This cut the MTSU lead to 24-14 with 7:01 left in the third quarter. The Blue Raider offense came right back, though. MTSU signal caller Austin Grammer capped off a seven-play, 63-yard drive with a 10-yard touchdown run. It was his second rushing touchdown of the game. This put MTSU’s lead back up to 17 with 4:55 left in the third quarter. ODU marched right down the field on their next drive. Quarterback Heinicke would find Vaughan for a 4-yard pass – their third touchdown connection of the night. This cut the Blue Raider lead back down to ten heading into the fourth quarter. In the fourth quarter, ODU had the ball down 31-21, but they couldn’t cut the lead down any closer. They weren’t able to convert due to the attacking Blue Raider defense, which had pressured Heinicke all night long. On this drive, Shubert Bastien and Leighton Gasque came up with back-to-back sacks. MTSU defense had six sacks the whole night. MTSU would come right back with a 53-yard strike from Grammer to wide receiver Marcus Henry, pushing their lead up to 38-21 with 10:48 remaining in the game. This touchdown pass was Grammer’s career-high 25th completion. ODU would score another touchdown to trim the lead to ten, but MTSU kicker Cody Clark would come back to connect on a 29-yard field goal to extend the lead to 41-28 with 5:18 left in the game. Any hope for a comeback from the Monarchs was dashed when Kevin Byard picked off Heinicke on ODU’s next drive, sealing the game for the Blue Raiders. MTSU wasn’t able to convert the first two ODU turnovers into points, leading to a scoreless first quarter. However, in the second quarter, the Blue Raiders exploded with 24 unanswered points. Shon Akins and TT Barber added an interception each to go with Kevin Byard’s interception and forced fumble to account for the Blue Raiders’ four turnovers. They also shut down ODU’s running game, which only managed 41 yards. They gave up 403 yards of total offense, but pressured Heinicke the whole game. The win moved MTSU to 3-2 overall and 2-0 in C-USA play. ODU fell to 3-2 overall and 1-1 in C-USA. Both teams sit atop the eastern division of C-USA.